The catacombs of Rome are the main sources of art by Christians in the 2nd and 3rd centuries A.D.
Markers often carry the image of a shepherd, lamb, anchor, fish, or some other symbol. 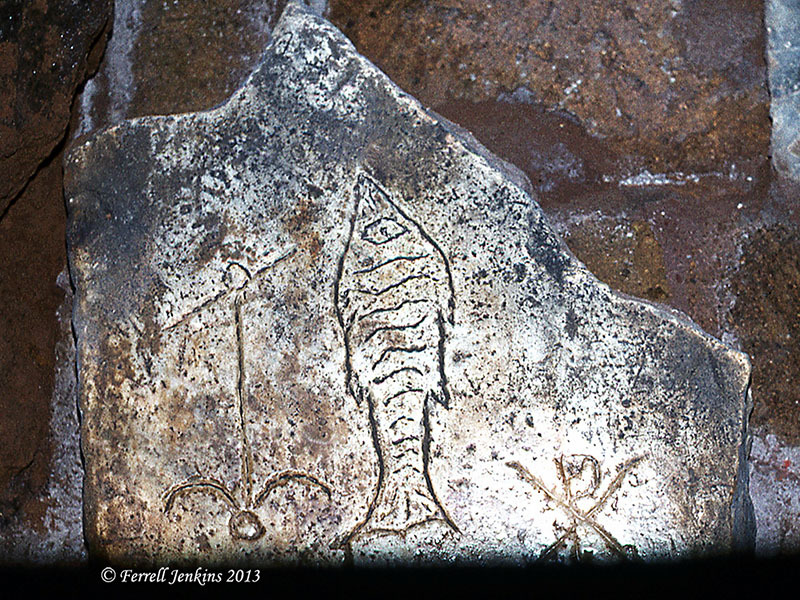 The fish or the word fish was used to indicate a Christian or a place where Christians met in those days. The Greek word for fish is Ichthus. When used as an acrostic with each letter standing for a word or phrase the word means, Jesus Christ, God’s Son, the Savior. But the very fact that the catacomb pictures are filled with heathen figures and conceptions intermingled with the Christian, shows that the simple faith had already begun to be corrupted, and that too much weight can not be attached to pictures which combine the Good Shepherd with flying genii, heads of the seasons, doves, peacocks, vases, fruits, and flowers. Marker in one of the catacombs. 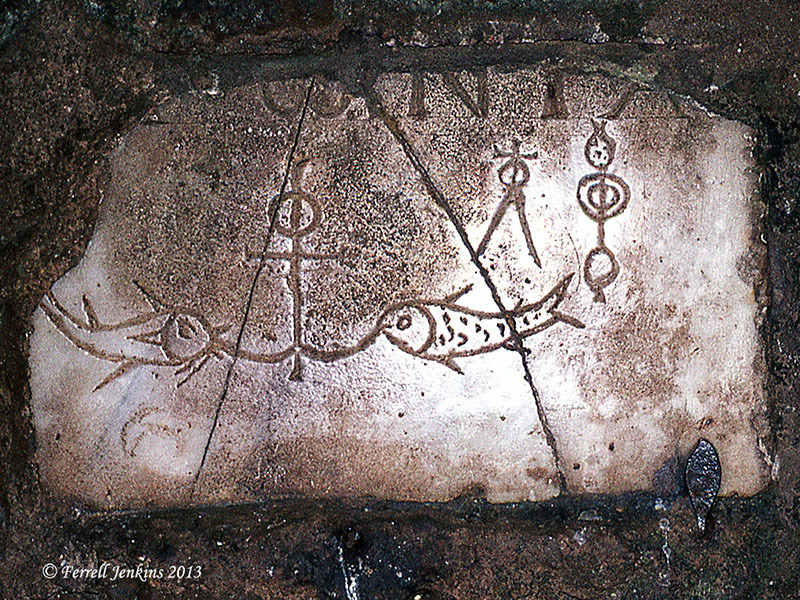 Note symbols of an anchor and fish. Photo by Ferrell Jenkins, 1973. Digitized from a slide. Foster shows that there is an apologetic value to the catacomb inscriptions. Although their faith, as witnessed on the walls of the catacombs, was imperfect, and at times confused, the modernists will have to chisel off these pathetic and challenging inscriptions before they can ever convince the world that Jesus of Nazareth is a myth (R. C. Foster, Introduction and Early Ministry, 29-32). Anchor, fish, and Chi Rho symbols. Slide Photo by Ferrell Jenkins, 1975. This entry was posted in Archaeology, Bible Places, Photography, Travel and tagged Ancient Rome, catacombs, Italy. Bookmark the permalink.